I didn’t do any Turkey Trots this year. But I did get in a very nice 5.7 mile run on a gorgeous sunny Black Friday. No shopping for me. 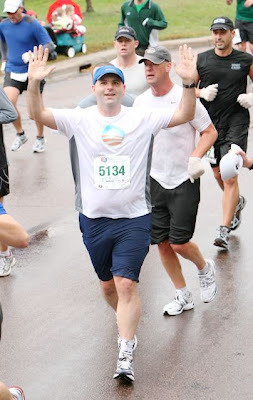 Such as it is, here is my report from the Oct 5 Twin Cities Marathon. I was rock steady all the way through with my goal and ended with a 4:31:23. Not bad considering I was under trained, overweight and coming off of a PF injury. It was very crowded in the beginning and my starting 5K was a little slower than expected. The weather was cloudy at the start but was pouring buckets by mile 2. This lasted until about mile 10 or so. At some points the water was coming down so fast the streets were filling up like rivers and we had to do some diversions around flooded areas. The last half it dried up and was perfectly cool and cloud covered. Much different from the 85+ from last year where I saw tons of people on the sidelines getting IV’s. I was really happy that I didn’t have to walk the 2 mile hill from mile 21 to 23. I was feeling sore but strong at that point and managed to keep on pace pretty well. If you’ve never run the TC before, you should. The course is absolutely gorgeous and there were people cheering every inch of the way. Even in the pouring rain. The best part is the finish in St. Paul. You come around a corner by the famous cathedral there and it’s a straight downhill 0.4 miles to the finish at the capitol. That section was my fastest pace of the race. One cool thing – as I was running along around mile 23 I heard someone call out my name. 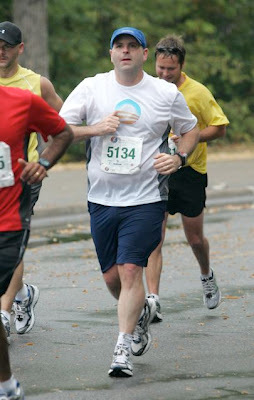 Turns out someone had seen one of my posts on Runnersworld where he saw a picture of my race shirt and read my blog. Small world.